A big announcement from Yahoo that most people won't really understand till it happens in mid-2009. This is a big chance for Yahoo to make email the killer app again, and take back the lead it has lost to social networks. I predict that (if Yahoo does it right), we'll be spending far more time inside our email than inside Facebook and Myspace. Lets hope I'm right. Email is broken and Yahoo is finally taking steps to fix it. This is going to be the most exciting internet development of 2009. Thought I'd paste this. Preclinical and Phase I failure rates should have been much higher. Or maybe we have to change trial design in both these phases. Then we'd be able to optimize venture financing and significantly improve venture returns. Phase II and III for Oncology are typically higher than for other drugs which is is equally unfortunate. McKinsey article today mentioned two great companies started in the worst economic times. HP and Polaroid started in 1930. Microsoft and Ebay also started in tough economic conditions. What equivalents of HP and Ebay will 2009 bring us ? At the MIT PEVC conference, I came across a simple startup last week that will make researching so much easier. Click here for the website. 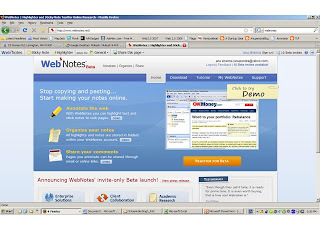 Webnotes allows you to annotate web pages, highlight sections, and store items from your internet travels in online folders. An integrated button in my firefox toolbar makes it simple to point and shoot (the tool appears in my browser in the picture above). If you like to save interesting items on the web, I'd recommend everyone to try it. If you're intensely researching something on the net, it savings having to download or print pages and pages of information. Everything you highlight will show up along with your notes neatly in a pdf that you can print or mail to anyone. I can now save useful information with a couple of clicks and remember why I saved it in the first place. The annual studies are conducted by the J. Robert Scott executive search agency, law firm WilmerHale, Ernst & Young, and academics at Harvard Business School. As for next year’s compensation data, let’s keep our fingers crossed for positive results. I just made a small donation to Wikipedia. They're raising $6MM, and are 60% of the way there. I encourage you to donate. Please click here to donate. They deserve the cash. I put out a new blog. Its called A Startup Idea. Since I am surrounded by startup ideas (both mine and from those around me), I thought I should start documenting the ones that we'd like to see but those that we don't want to start ourselves. Hopefully someone will take up these ideas and create the products that we want. Candlelight vigil for Mumbai victims on City Hall Plaza today. Please join in a Candlelight Vigil being planned for today (Thursday, December 4 at 6 PM) at Boston City Hall Plaza, Worcester City Hall steps and the Rhode Island State House steps. This is to share our solidarity with all the civilized, caring peoples of India and the United States and to express our outrage and sorrow at the terrorist attacks last week in Mumbai.Please come in large numbers. 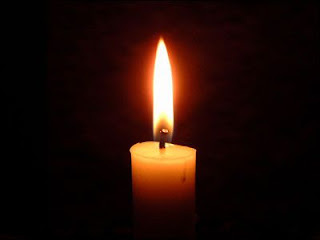 Ask everyone to bring a candle or a flashlight if they can and let's have many thousand points of lights!